Choosing a winning domain name for your site can only happen after you've decided what type of website to build. You want a domain name that is eye-catching. Something that people will remember. Let's look at some things that will make all the difference when choosing your domain name. There are 4 generic top-level domain name extensions for choosing. There are 3 generic top-level domain name extensions that are restricted for use. While there are over 300 domain name extensions that you can choose from, you want to stick with the .com domain name extension if you have plans to build a profitable business website. The .com domain is automatically assumed when typing in domain names in your web browser. This is pretty much the assumption by you and everyone else. If someone tells me a web address, I automatically assume .com. If the domain name you have chosen is already taken by someone else, should you use the .net or .org domain name extension? There used to be a distinction that the .org domain name extensions were only for non profits and the .net domains were for Internet companies. This is not true. Either can be used by anyone. However, I would recommend going with the .com extension (with an alternate name not taken) for an end user's ease of use. While you are deciding on the type of website to build and researching keywords, you've probably noticed there are at least 5 top keywords. Keeping those keywords in mind, think about what you could pair with them that would be a winning domain name. Remember, your domain name is your brand. It's how you will be known all over the web. 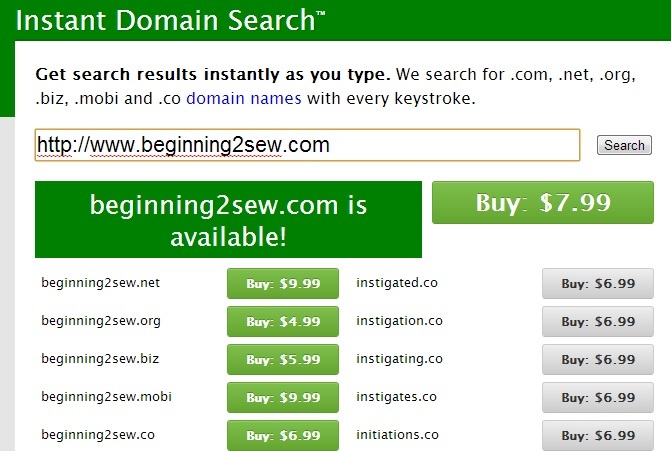 It would make sense that your domain name might be something like "beginning2sew.com". Let's go search to see if that domain name is available at the Instant Domain Search site. The .com domain name extension is available. You could also think about purchasing the .net, .org or .biz domains if you want to protect your brand and keep anyone from purchasing the others. It leaves less room to confuse your site with another if you own them all. However, it's not a necessity to buy them all. Choose a winning domain name and leave the .net, .org or .biz sites eating your dust. There are no prizes for choosing for the longest domain name. Keep your domain name as short and simple as possible. Not only does this make it easy to remember but it's easy to type too. Don't use hyphens in your domain name. This makes it harder to both type and remember. Avoid Copyright Infringement by checking to make sure you aren't in violation before you buy your domain name. There would be nothing worse than to build a profitable business website only to receive a cease and desist letter forcing you to shut down. Let's suppose you wanted to use begintosew.com as your domain name. Now we need to find out if the domain name you have chosen is available. You can do this by using several sites on the web including the Instant Domain Search. When entering this domain name, you'll see it is not available. To see who owns a domain name, you can click on the WHOIS button or Visit the site. If your perfect domain name is not available, you can go with an alternate domain name extension such as .net or .org. However, I would recommend you select a alternative domain name and go with the .com extension. Like I said earlier, when people think of searching the web they think of .com automatically. Don't make it hard to find your Website. Choose a winning domain name and users have no problem finding you. Prior to registering your domain, I would suggest that you select who will host your website so you don't have to transfer it later. It's not a big deal but it would be one less step you have to do. If you're not to that point yet, go ahead and register a winning domain name for your website before someone else takes it. Domain.com offers registration for a .com domain for 9.99 per year. Using the domain name extension .net, the price is 8.99 per year. If you choose .org, the price is 10.47 per year. Register.com offers many hosting packages as well as a 9.99 domain name registration and e-mail package. As of today, GoDaddy.com looks to be one of the cheapest domain name registrars. If you choose the domain name extension of .com, it is priced at 9.99. The .co domain name extension is 9.99 and .info is 2.99. They also have a sale going on for a .US domain (showing you are in the US) for 3.99 per year. With Site Build It, it's only only about the domain registration and website hosting. It's about an all inclusive package of both website hosting and building tools for your website. If you're worried about all the tech specifics of a web hosting service, don't, they'll all basically the same except Site Build It. No other hosting company can offer you hosting and tools to succeed. Site Build It offers a Web hosting package with the guidance of action guides to allow you to build a profitable business website. Let's be real here for a moment. If you're going to be successful, it will take work so why not start where there's a proven track record for success. Site Build It offers you all of it in one package; web hosting, site brainstorming, keyword tools with stats that guide you through the keyword selection process, hosting as well as marketing tools. Combine Site Build It with a winning domain name and you're on the road to success. An all inclusive package with Site Build It is 29.99 per month if you choose their monthly plan. It's cheaper if you go with an annual subscription. Yes, it may cost a little bit more than all the other hosts but the other hosts do not provide you with tools to be successful. Site Build It does. Don't fall for cheap, go with the best website hosting company. You'll be glad you did. The statistics are there to prove it.....62% of Site Build It sites end up in the top 3% of ALL Web sites on the net, the proof is there. Site Build It also offers a 90 day risk free trial. There's no reason not to give them a try. Do your own comparison and you'll be as convinced as I was. I am glad I made the right choice on web hosting. ***Included in your Site Build It subscription are tools to make it easy to pick a winning domain name. In summary, you want to take your great idea in combination with your keywords to come up with a winning domain name, register it and decide on who will host your site (If you haven't already decided).